Overly limiting food plans that we can’t stick to aren’t helpful in any way, shape, or form—and sometimes they actually cause us to binge on the foods we were totally depriving ourselves of in the first place. That’s why we like to be more mindful of our diet—and why we’re so on board with healthy food swaps. Take, for example, my obsession with having milk in my coffee—my friends joke it’s half milk and half java—so recently I decided to switch out regular dairy for coconut milk. Now I feel less guilty about that extra pour (or two). But there are actually a ton of healthy food swaps you can make. Lindsay Surowitz, holistic nutritionist and founder of Weeknight Bite, refers to them as “upgrades” with her clients. “If I were to tell people they had to say goodbye to chocolate, pasta, or pizza in order to reach their goals, I wouldn’t have a job,” she says. “That’s no way to live—and honestly, life is too short not to eat the foods we truly love and crave.” Surowitz shares the belief with us that when it comes to healthy living, a large part of it is figuring out how to satisfy cravings in a healthy way. And yes, that means you can still have the real deal every once in a while, too. The goal is to make swaps a majority of the time so that you have a little more flexibility to indulge when the moment strikes. “Cliché as it may seem, balance is everything, and it can actually be pretty easy,” Surowitz says. The health maven has graciously decided to share nine of her favorite healthy food swaps with us. Read on to see the exclusive tips she shares with her clients below. Cereal is such a great, quick, and simple breakfast. 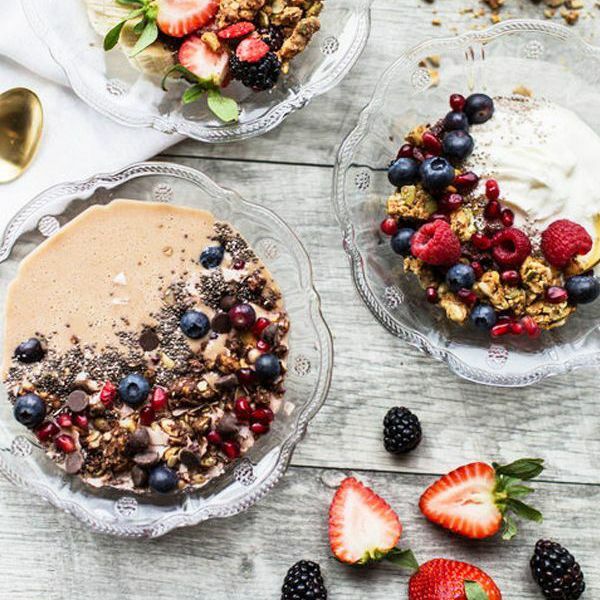 “But skip the boxed cereals that are primarily carbs and sugar and go for some granola bowls with a granola from Purely Elizabeth,” says Surowitz. If you need a flavor suggestion, she says to try the grain-free banana. Or opt for Kitchfix granola, which is made with nuts and seeds and is lightly sweetened with coconut sugar or pure maple syrup. Pizza is kind of the best comfort food, but the bread in the crust is not really your friend. Surowitz suggests a lower-carb and more nutrient-rich option like cauliflower crust pizza. Don’t have time to prep your own dough? Caulipower, Cali’Flour, and Trader Joe’s all make options Surowitz stands behind in a pinch. “Or do a portobello pizza night and set up a topping bar where you can get creative and make your own combinations," she says. A seriously easy upgrade is cauliflower rice. … You can even buy it premade and skip the mess,” says Surowitz. If you’re skeptical about this one, try this cauliflower fried rice recipe with corn, peas, fried egg, and more, and you’ll be hooked. “Switch out the regular pasta for something that won’t cause as much of a blood sugar spike,” suggests Surowitz. In terms of a healthy food swap, chickpea pasta is packed with fiber that will keep you full and balanced. Or you can go extra light with pesto zoodles or spaghetti squash noodles. If you’re craving something salty and crunchy, skip the crackers with a long list of random ingredients and additives. “Go for those that are made with nuts and seeds and easy-to-pronounce ingredients,” explains Surowitz. Some of her go-tos include Simple Mills or Jilz Crackerz. When it comes to chips, Siete Foods makes delicious grain-free chips (and tortillas, too, for that matter). “It’s important to get comfortable reading ingredient labels and scoping out nutrition facts,” says Surowitz. “My advice is always the more simple and real the ingredients, the better.” This is especially true when it comes to chocolate. Opt for something like Hu Kitchen chocolate bars—especially the cashew butter or almond butter puffed quinoa—or Eating Evolved chocolate bars and coconut butter cups. And how to satisfy a post-dinner chocolate craving? The nutritionist whips up a collagen hot chocolate—which she insists is cozy, delicious, and healthy. Surowitz calls no-dairy ice cream “nice cream,” and we kind of love it. It calls for sliced bananas, some of your favorite fruit, coconut cream, and any other add-ins (she uses cacao nibs and pitted cherries in this recipe). “It’s fun to make and easy to customize with your favorite flavors,” she says. Another nutritionist-approved swap: Pressed Juicery makes a Pressed Freeze, which acts as frozen yogurt (its vanilla flavor is made with just four simple ingredients: dates, almonds, vanilla, and sea salt). When it comes to cookies and cookie dough, the way to go is with this paleo chocolate chip cookie recipe. Or if you’re more of a cookie dough fan, you can try a simple almond flour no-bake cookie dough ball recipe. Not a baker? Simple Mills crunchy or soft-baked cookies are gluten-free and will satisfy your cravings in a pinch. Now that you've read about these healthy food swaps, it's time to add them to your daily routine. With just a few simple tweaks, you'll be eating your way to better nutrition.